A boutique yoga studio in Greenbelt,MD providing vinyasa yoga, health coaching and fitness classes for adults of all levels. Have you built a privacy fence around your emotions? Have you seen the houses that have giant privacy fences around them? The eight foot tall metal or wooden fences are to protect the people within the house from the "bad people", right? It also means that they are shielding themselves from the "good people" as well. Building your security fence means that the people you love are left on the outside waiting for your permission to enter. How long will they wait there? When will you notice them? Looking at your own life, have you built a privacy fence around your emotions? Have you created an armor to protect yourself because you refuse to be hurt, again? Is it possible that you are so focused on protecting yourself that you are missing out on opportunities of joy and happiness? Let go on the need to control the outcome and allow yourself to experience the fullness of your life. Bad things will happen, feelings will be hurt but there will also be so many experiences that are full of joy and laughter. We have to surrender into the moment and trust that living life to the fullest is about being vulnerable. Allowing ourselves to be vulnerable to those experiences, good and bad, that is what makes us compassionate human beings. Yoga is beyond the shapes we make on our mats, it's a life choice to tune in to our emotions and learn how to surrender into the moment. Come and practice with me and together let's tear down the privacy fences surrounding our hearts. Check out the calendar to reserve your space. 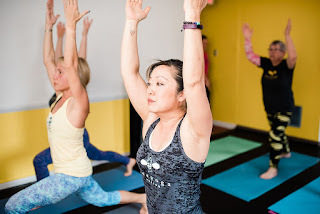 Bee Yoga Fusion is a boutique yoga studio in Greenbelt, MD providing vinyasa yoga, personalized health coaching and fitness classes for adults of all levels. Hours: see Schedule for class times, the boutique is open during class times. Stay up to date on what we are doing, join the insider club! Bee Yoga Fusion LLC 111 Centerway (2nd floor) Greenbelt, MD 301-575-6339 Gretchen@BeeYogaFusion.com. Powered by Blogger.